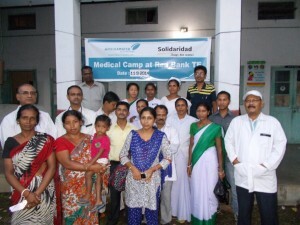 Solidaridad, an international development organization in collaboration with Amalgamated Plantations Private Limited has conducted a set of 4 medical camps for workers and their families in closed tea gardens of West Bengal in the vicinity of Amalgamated Plantations Pvt. Ltd. gardens. Both the organisations are working on sustainable development of the tea industry in India and are concerned by several reports in media about hardship faced by workers in the closed tea gardens. This initiative focused on addressing immediate medical needs of the population, to augment the role played by the Government and the Tea Board of India. The medical camps will initially be organized in the Red Bank, Dharinpur and Surendra Nagar tea gardens in 2 phases and would benefit the affected population of 6000 people in the vicinity. 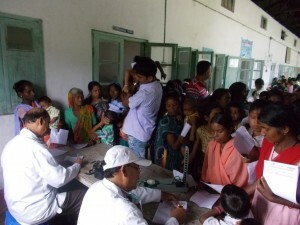 In the 1st phase the total turnout as per registration was 1228 patients including children and pregnant ladies. Apart from medication, children upto the age of 6 years were provided Nestogen, Biscuits and Chocolates. As per the feedback received from the closed garden committee members , the camps were a great success and they were very satisfied with the medical attention , treatment and medicines provided onsite. 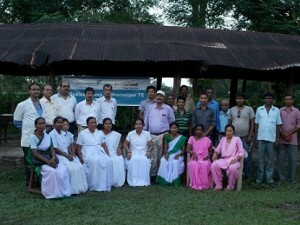 The camps were conducted by the medical team from all the 4 Amalgamated Plantations Pvt. Ltd. Dooars gardens consisting of Dr Phangcho and his team from Rungamuttee , Dr. Kundu and CHV of Noweranuddy, paramedical team of Batabari and the whole camp was coordinated by Dr D Sengupta and his team including 1 welfare officer from Dam Dim. Messers Saroj and Circar from Solidaridad were also present at the camps. The management team of the 4 Amalgamated Plantations Pvt. Ltd. gardens arranged for the logistics and were actively involved with the local administration in arranging the camps. The camp was assisted by representatives of Health & ICDS departments, and visits were also made by the Head of ICDS and BMOH.